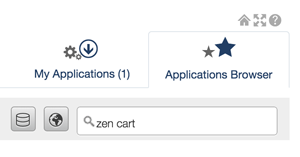 If you have a cPanel shared hosting account, you can install Zen Cart (a popular application to create an online store) through the built-in application installer, Installatron. In cPanel, click the Applications tab. On the page that displays after clicking Install, you can see your Zen Cart installation details, including the URL you can use to log in to your Zen Cart admin panel (highlighted below).